Thrifty Thursday is back. Yea!!!! 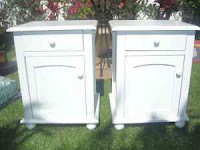 To kick things off, we're looking at nightstands. 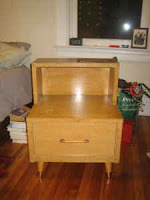 I tried to go with something modern, but as it turns out, they stopped making quality, wood nightstands back in the 60's! 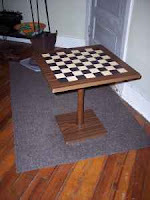 Now you can play chess until the wee hours of the night! Add a funky retro flair to your bedroom. 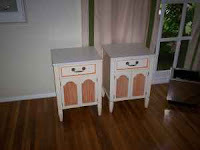 Super cute and practicle with large drawer and small hutch for keeping things in order. Perfect if you're looking for a little extra storage space. Each stand has a cabinet and small drawer. So adorable! Curtains close off the cabinet doors. You can easily change the look of your room whenever you want by changing out the fabric. If you read my blog regularly, you've probably guessed that these are my favorites! Great price for such great pieces.